Cape Abu Shagara Egypt-Saudi Arabia-Sudan. 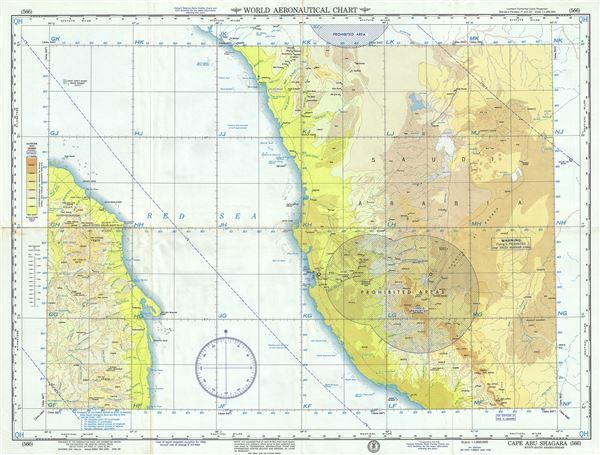 This is an unusual 1958 U.S. Air Force aeronautical chart or map of western Saudi Arabia and eastern Sudan focusing on Cape Abu Shagara in Sudan. Centered on the Red Sea, it covers from the Gebel Elba region in Egypt south to Port Sudan and from Yanbu in Saudi Arabia south to Al Lith and inland as far as Turbah (Turabah). The map is highly detailed, noting prohibited areas over Mecca and Medina, warnings, important cities, towns, rivers, roads, deserts as well as other hydrographical and topographical features essential for the air pilot. Verso of this chart features legends and a world aeronautical chart index. This chart was published by the USAF Aeronautical Chart and Information Center, and was issued as chart no. 566. First issued in 1947, this is the fifth edition revised to March 1958.